For racehorses, retirement from racing can be an uncertain time. 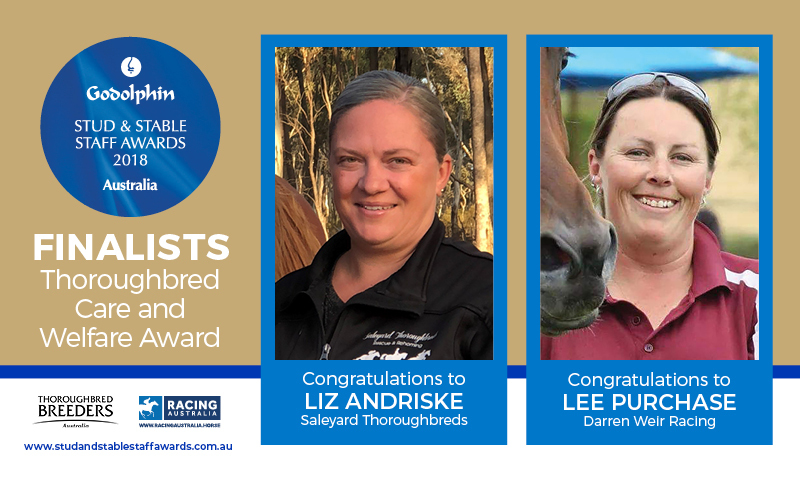 But thanks to people like Lee Purchase and Liz Andriske and the other nominations in the Care and Welfare Category, many of those horses who can’t move on to a breeding career, or whose owners have nowhere to keep them, don’t end up disappearing forever. To them, the slow, the injured and the indifferent are increasingly receiving the after-care they deserve. Lee and Liz have between them re-homed hundreds of former racehorses and, for both, the GSSSA offers recognition ahead of any reward. “The Stud and Stable Staff Awards serve an amazing purpose for the little people of racing,” said Lee, who also works full time as a stable hand for Victorian trainer Darren Weir. Liz and her husband Gary operate Saleyard Thoroughbreds, a halfway house for horses at Maryborough in central Victoria. Gary nominated his wife who, he says, works hard every day looking after horses at their small, self-funded operation. “It is a business where every day is an achievement,” he said. Liz is grateful for the recognition and hopes it will lead to more being done for homeless horses. “It’s great that the industry is recognising the work that people are doing for horses after racing and supporting people like myself and the other nominees – it’s a great step forward,” she said.